Components of theinsulin signaling pathway are important regulators of growth. TheFOXO (forkhead box, sub-group "O") transcriptionfactors regulate cellular processes under conditions of low levelsof insulin signaling. Studies in mammalian cell culture show thatactivation of FOXO transcription factors causes cell death or cellcycle arrest. The Caenorhabiditis elegans homologue ofFOXO, Daf-16, is required for the formation of dauer larvae in responseto nutritional stress. In addition, FOXO factors have been implicatedin stress resistance and longevity. We have identifiedthe Drosophila melanogaster homologue of FOXO (dFOXO),which is conserved in amino acid sequence compared with the mammalianFOXO homologues and Daf-16. Expression of dFOXO during early larvaldevelopment causes inhibition of larval growth and alterations infeeding behavior. Inhibition of larval growth is reversible upondiscontinuation of dFOXO expression. Expression of dFOXO duringthe third larval instar or at low levels during development leadsto the generation of adults that are reduced in size. Analysis ofthe wings and eyes of these small flies indicates that the reductionin size is due to decreases in cell size and cell number. Overexpressionof dFOXO in the developing eye leads to a characteristic phenotypewith reductions in cell size and cell number. This phenotype canbe rescued by co-expression of upstream insulin signaling components,dPI3K and dAkt, however, this rescue is not seen when FOXO is mutatedto a constitutively active form. dFOXO is conservedin both sequence and regulatory mechanisms when compared with otherFOXO homologues. The establishment of Drosophila as a model forthe study of FOXO transcription factors should prove beneficialto determining the biological role of these signaling molecules.The alterations in larval development seen upon overexpression ofdFOXO closely mimic the phenotypic effects of starvation, suggestinga role for dFOXO in the response to nutritional adversity. Thiswork has implications in the understanding of cancer and insulinrelated disorders, such as diabetes and obesity. The biological control of the size of an organism is one of themost elusive concepts in biology. What mechanisms determine thesize differences between species? What genetic and environmentalfactors contribute to variations of size within a species? How doesan individual regulate the size of its organs to maintainproportion with the rest of the body? Although much remains unanswered,it is clear that the size of an individual is directly related tothe number of cells it has, and the size of these cells [1–3]. Thus, the finalsize of an organism is determined by the number of cell divisionsthat occur during development, and the amount of growth these cellsundergo. When considering the size difference between two organisms,such as a mouse and a human, it is obvious that the main cause ofthe size difference is the total number of cells .Intuitively, this may lead to the conclusion that the size of an organismis related to the rate of cell proliferation during development.However, experimental evidence shows that there are more subtlecontrols involved [4, 5]. For example, increasingor decreasing cell proliferation in the Drosophila imaginal discsdoes not alter the final size, but instead produces discs with eitheran increased number of small cells or a decreased number of largecells [4, 5]. These studiesindicate that there must be a genetically predetermined total cellmass and a mechanism for sensing this critical size. Studies in Drosophila demonstrate that the evolutionarily conservedinsulin signaling pathway is involved in the control of body size,through alterations of cell size and cell number .Seven Drosophila insulin-like peptides (Dilps) have been identifiedthat are able to promote organism growth when expressed ubiquitouslyduring development [6, 7]. The Dilps activatecell signaling through the Drosophila insulin receptor (dInr), areceptor tyrosine kinase, which can promote growth when overexpressedin the developing eye [6, 8]. Loss of function mutationsin dInr are lethal during embryogenesis . However,reduction of dInr levels through combination of weak heteroallelicmutations , or through partial lossof function mutations, reduces growthand leads to the development of small adults that have reduced cell sizeand number. In mammals, the insulin receptor promotes signalingthrough adaptor proteins, the insulin receptor substrates (IRS)1–4, which are required to activate phosphoinositide-3-kinase (PI3K) [10, 11].PI3K is a lipid kinase that phosphorylates inositide lipids on the innersurface of the cell membrane, leading to the activation of the serine/threoninekinase Akt. Once activated, Akt phosphorylates many substrates thatare involved in the regulation of metabolism, cell death/survival,and cell proliferation. Negative regulation of insulin signaling occursthrough the tumor suppressor, PTEN. PTEN removes phosphates frominositide lipids, thus acting in opposition to PI3K. This signalingmechanism appears to be conserved in Drosophila, and the Drosophilahomologues of IRS 1–4 (chico), PI3K (dPI3K), Akt (dAkt) and PTEN(dPTEN) have all been individually implicated in the regulationof cell size, and cell number .Flies that are homozygous for a null mutation in chico aresmaller than normal due to a reduction in cell size and cell number . Null mutations in dAkt arelethal , however, rescueof dAkt mutants through ectopic expression of dAkt duringembryogenesis results in a small fly phenotype  similar to that seen with chico mutantsand through reduction of dInr activity. Clearly, components of theinsulin signaling pathway act to control body and organ size throughregulation of cell size and cell number during development. In addition to developmentally predetermined size control, manycells and organisms can alter their size according to environmentalstimuli, such as nutrient limitation. When Drosophila larvae areraised under nutrient limited conditions the adults are smallerthan well-fed flies[15, 16] Thisphenomena appears to be phenocopied in the generation of small adultsthrough inhibition of Drosophila insulin signaling [6, 9, 12, 14].Interestingly, expression of Dilps 3, 5, and 7 hasbeen linked to the availability of nutrients .These Dilps are produced in neurosecretory cells in the larval brainwhere they are released into the circulatory system .These studies indicate that nutritional signals may regulate bodysize by modulating the levels of Dilps 3, 5, and 7 in the body. Newly hatched Drosophila larvae require a nutritional signalto initiate the cell cycle in mitotic tissues . Well-fed larvae increase their bodymass very rapidly due to replication of cells in mitotic tissues.In contrast, larvae hatched into conditions of amino acid starvationlive in a state of developmental arrest for several days until nutrientsbecome available to initiate the cell cycle[16, 17]. Dominantnegative inhibition of dPI3K in developing Drosophila larvae hasbeen shown to phenocopy the effects of amino acid starvation . Expression of dPI3K in subsets ofcells in the imaginal discs of starved larvae allows these cellsto divide in the absence of nutritional signals . Expression of dPI3K in the fat bodiesof starved larvae significantly reduces their survival, thus conferringstarvation sensitivity in these larvae .This suggests that Drosophila insulin signaling may play a protectiverole in the response to starvation. An insulin-like signaling pathway involved in the response tonutrient limitation also exists in the nematode Caenorhabiditiselegans. When C. elegans are raised under conditionsof nutrient limitation, they enter an alternate developmental stagecalled the dauer larvae. The dauer stage is characterized by arrestof growth at a sexually immature stage along with altered metabolismto increase the storage of fat .Mutations in components of the insulin signaling pathway in C.elegans lead to dauer larvae formation and increased life span [20–24].A null mutation in the C. elegans gene, Daf-16, negatesdauer formation and the life expanding effect of these mutations [21, 25, 26]. Thus, in C.elegans, Daf-16 is necessary for dauer formation and seemsto be the primary effector molecule under conditions of low levelsof insulin signaling. Daf-16 is the C. elegans homologue of a highly conserved groupof Akt phosphorylatable forkhead transcription factors, the FOXO(forkhead box, subgroup "O") transcriptionfactors. These transcription factors were first discovered as proto-oncogenes,which were disrupted as a result of chromosomal translocations leadingto acute myeloid leukemia and rabdomyosarcoma[27, 28].Three versions of FOXO have been identified in humans (FOXO1, FOXO3a,and FOXO4; formerly known as FKHR, FKHR-L1, and AFX) and mice (Foxo1,Foxo3, and Foxo4), and additional homologues have been identified inzebrafish and chickens. The FOXO transcription factorsshare a highly conserved forkhead box DNA binding domain in theN-terminal half of the protein, and three highly conserved Akt phosphorylationsites. Mammalian cell culture studies have shown that in the absence ofAkt signaling, FOXO is able to activate gene transcription and causecell death, cell cycle arrest, or cell senescence [30, 31].In the presence of activated Akt, FOXO becomes phosphorylated andis sequestered in the cytoplasm through facilitation of 14-3-3 binding [32–35], and/ordisruption of a nuclear localization signal[34, 36]. Thedown-regulation of FOXO in this manner is, possibly, one of themost important consequences of Akt mediated signaling. Based on evidence from studies in C. elegans and mammaliancell culture, it appears that FOXO transcription factors are a criticalmediator of cellular processes under conditions of low levels ofinsulin signaling. 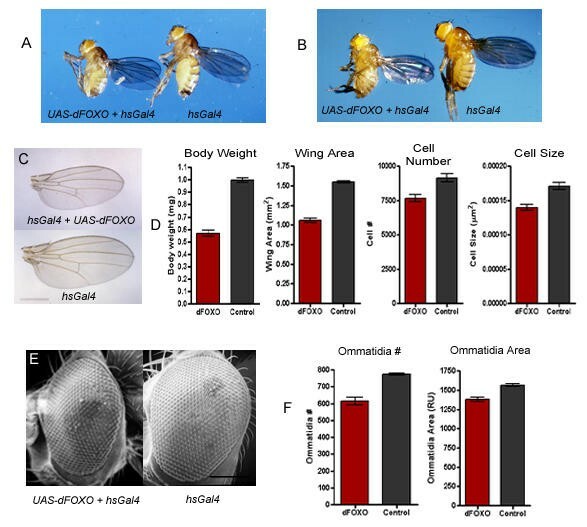 To investigate this further, we have identifiedand characterized the Drosophila melanogaster version of FOXO.We show that Drosophila FOXO (dFOXO) retains the conserved domains seenin other organisms and is involved in the regulation of growth.Of special interest is that dFOXO appears to have an effect uponfeeding behavior, and may be a key player in the response of Drosophilalarvae to nutritional stress. The dFOXO gene consists of 10 exons and is spread out overapproximately 31 kb in polytene chromosome section 88A within thegenomic scaffolding region, AE003703, of the Berkeley DrosophilaGenome Project (BDGP) (Figure 1A). dFOXO encodesa theoretical protein of 463 amino acids (Figure 1B). Analysis of thecomplete Drosophila genome for additional dFOXO homologues revealednone. dFOXO encodes a protein that retains importantfunctional domains found in other FOXO homologues. (A) Schematicrepresentation of the dFOXO cDNA clone LD05569 and its locationin the genomic scaffolding, region AE003703, of the BDGP sequence. (B) ClustalW alignment of the proposed dFOXO amino acid sequencewith that of mammalian homologues (FOXO1a, FOXO3a, and FOXO4) andDaf-16a1. Highlighted are: the T1, S1, and S2 Akt target sequences(yellow shading); the potential DYRK1a/mnb phosphorylation site(arrow, and grey shading); and the forkhead box DNA binding domain (blackbox). "*" indicates nucleotides that are identical in all sequencesin the alignment, ":" indicates conserved substitutions, accordingto the chemical nature of the amino acids, and "." indicates semi-conservedsubstitutions. Colors indicate the chemical nature of the aminoacid; Red = small hydrophobic (including aromatic), Blue = Acidic,Magenta = Basic, and Green = basic amino acids with hydroxyl groupsand/or amine groups. Alignment of dFOXO with the human homologues of FOXO and Daf-16a1using ClustalW  (Figure 1B) revealed that althoughthe overall identity of amino acids is not high, the identity inthe forkhead box DNA binding domain is between 74 and 86 percent.The Akt phosphorylation sites are also well conserved in their relativeposition in the protein, and in sequence. The T1 site is located atT24 in dFOXO, the S1 site at S160, and the S2 site at S239. Thesesites align well with the human FOXO homologues in the ClustalWalignment, however the Daf-16 S1, and S2 sites are slightly outof line (Fig 1B).All three of the potential Akt phosphorylation sites in dFOXO fitthe Akt consensus target sequence (RxRxxS/T). Other notable features found in FOXO homologues include a DYRK1aphosphorylation site, a 14-3-3 binding site, a nuclear localizationsignal (NLS), a nuclear export signal (NES), and Ral dependent phosphorylationsites. A DYRK1a phosphorylation site was confirmed experimentallyin FOXO1 at S329 . This serine residueis conserved in human FOXO3a (S324), FOXO4 (S267), Daf-16a1 (S317),and dFOXO (S248) (Figure 1B).In addition, the sequence surrounding this site in dFOXO (LS248PI)is identical to that in FOXO1. The high conservation of this sequenceindicates that dFOXO may be phosphorylated at this site by the Drosophilahomologue of DYRK1a, minibrain (mnb). Binding to 14-3-3 proteins is thought to be an important partof FOXO sequestration [30, 31].14-3-3 proteins normally bind to a consensus site containing a phosphoserineresidue, either RSxSPxP, or RxxxSPxP . In the case of dFOXO, the sequencesurrounding the T1 Akt phosphorylation site fits the former perfectly,aside from the substitution of a threonine for a serine. It hasbeen shown experimentally that 14-3-3 does bind to this site in FOXO1 , FOXO3a ,and Daf-16, hence, it is likelythat this region functions as a 14-3-3 binding site in Drosophila. The current model for FOXO deactivation suggests that a NES existswhich causes constitutive localization of FOXO in the cytoplasmin the absence of a functional NLS . Anon-conventional NLS was identified in human FOXO4 from amino acids180–221 . The corresponding sequencein dFOXO (amino acids 147–194) is 38% identical and 66% similarin amino acid content (Figure 1B). Thissimilarity suggests that this region may act as an NLS in dFOXOas well. A leucine rich NES has been identified in FOXO1 (368 MENLLDNLNL 377)and the conservation of this sequence is quite high FOXO3a, FOXO4,and Daf-16 (Figure 1B). The correspondingregion in dFOXO retains two of the important leucine residues (281 LTGTMADELTL 291).However, the remaining sequence is more divergent, and mayor may not act as an NES in Drosophila. FOXO4 has previously been shown to be phosphorylated in a Ral-dependentmanner at threonines 447 and 451.However, these sites do not appear to be conserved in the otherhuman FOXO homologues, Daf-16, or dFOXO (Figure 1B), indicating thatRal dependent phosphorylation of FOXO may be specific to FOXO4. Interestingly, the carboxy-terminal three amino acids are conservedbetween dFOXO and FOXO1 (VSG). Also, FOXO3a contains a similar sequencein the final three amino acids (VPG). In view of this conservation,it is possible that this tail plays a functional role in FOXO regulation. Drosophila larvae feed continuously for about 5 days after egglaying (AEL). During this time the appetite and growth rate of thelarvae is enormous. If young larvae are deprived of food, they donot grow and tend to disperse randomly[16, 17, 42]. When the foodsupply is replenished, the larvae immediately move towards it andcontinue eating until they are close to pupation. If the food supplyis depleted, the larvae will disperse again.We utilized the UAS/Gal4 ectopic expression system  to overexpress dFOXO in the developinglarvae under the control of the ActGal4 driver. This resulted in complete developmentalarrest of the larvae, which remained as first instar for up to 7days (Figure 2A),similar to the life expectancy of starved larvae [16–18].This trend was also seen using a constitutively active version of Murine Foxo1(mFoxo1) containing an alanine substitution at the T1 (T24A), andS1 (S253A) Akt phosphorylation sites (mFoxo1-AA)  (Figure 2A).In addition, larvae expressing dFOXO and mFoxo1-AA were often foundto be wandering far from their food supply. We monitored feedingbehavior by assessing the number of larvae away from their foodat 48 and 72 hours after egg laying (AEL). Larvae expressing dFOXOand mFoxo1-AA showed a 3–4 fold increase in wandering over larvaeexpressing Gal4 alone (Figure 2B).Thus, dFOXO expression drastically alters feeding behavior and isable to induce a starvation type response in larvae which have anadequate food supply. Expression of dFOXO in first instar larvae phenocopiesstarvation and effects feeding behavior. Expression of dFOXOand mFOXO1-AA early in larval development using the (A) ActGal4 and(C) hsGal4 driver lines leads to developmental arrest similarto that seen in starved larvae. Developmentally arrested larvaeare capable of surviving for up to seven days after egg laying (AEL). (B) Expression of dFOXO (red bars) and mFOXO1-AA (green bars) leadsto alterations in feeding behavior when compared to controls (greybars). The percentage of wandering larvae is significantly greaterin larvae expressing dFOXO and mFOXO1-AA at 48 hours and 72 hoursAEL (p = 0.05). Expression of dPI3K-DN (blue bars) did not increaselarval wandering. (D) Developmental arrest is reversible upon removalof dFOXO expression (red bars), but not upon removal of mFOXO1-AAexpression (green bars). Grey bars represent the controls. Eachbar reflects the average of three separate trials, with 50 larvaeper trial. Genotypes are; (A-top, B-grey bars) w; ActGal4/+,(A-middle, B-red bars) w; ActGal4/+; UAS-dFOXO/+, (A-bottom,B-green bars) w, UAS-mFoxo1-AA/w; ActGal4/+, (C-top, D-greybars) w; hsGal4/+, (C-middle, D-red bars), w; hsGal4/UAS-dFOXO,(C-bottom, D-green bars) w, UAS-mFoxo1-AA/w; hsGal4/+,(B-blue bars) w; ActGal4/UAS-dPI3K-DN. In Drosophila, PI3K consists of an adaptor subunit, dp60, anda catalytic subunit, dp110. 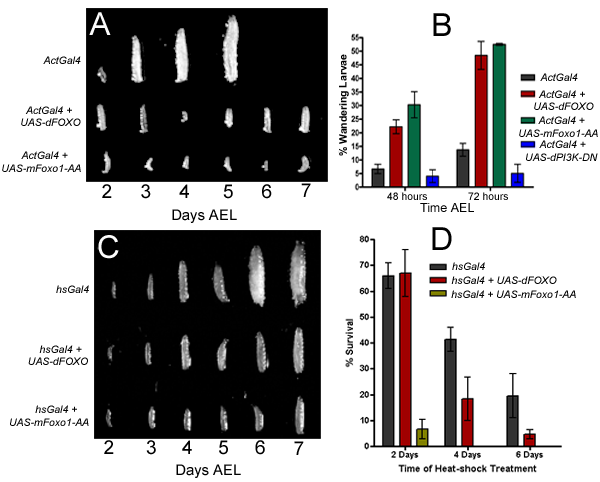 Unexpectedly, expression of an inhibitoryor "dominant negative" version of dp110 (UAS-dPI3K-DN) under the control of the ActGal4 did notlead to increased larval wandering (Figure 2B). Expression of this construct alsodid not appear to inhibit larval growth, whereas other negativeregulators of insulin signaling do .It is possible that the level of expression of this construct isnot high enough under the control of the ActGal4 driver to havea complete dominant negative effect. Starved larvae which are developmentally arrested are able toresume growth upon acquisition of food .We examined if larvae that were expressing dFOXO could resume growthupon termination of dFOXO expression. To do this we utilized the hsGal4 driver . dFOXO was expressed in thelarvae by heat shock treatment (HST) for 10 minutes every 24 hours.This treatment was sufficient to inhibit growth while allowing controlsto survive to adulthood with a 48 hour delay in the time to pupation (Figure 2C). When dFOXO expressionwas discontinued after 2, 4, and 6 days of HST, developmentallyarrested larvae were able to recover with decreased levels of survival astime progressed (Figure 2D).Significant lethality was observed in controls as well suggestingthat low survival rate was partially due to the expression of Gal4,which can induce apoptosis , or the HST itself(Figure 2D).Nevertheless, developmental arrest caused by dFOXO is clearly reversibleas these individuals could be returned to their normal path of development. The formation of dauer larvae in C. elegans is a developmentalresponse to nutrient limitation .The dauer larvae provides a temporary defense mechanism allowing thenematode to persevere until nutrients are available, at which pointdevelopment can continue. Interestingly, constitutive activationof Daf-16 by mutation of its Akt phosphorylation sites to alanineresidues causes obligatory dauer larvae formation. We found a similar result in the Drosophilalarvae using the constitutively active mFoxo1-AA . This construct had an effect similarto that of dFOXO when expressed under the control of ActGal4 (Figure 2A), and hsGal4 (Figure 2C). Upon removal fromHST, larvae expressing mFoxo1-AA did not resume growth but remainedin a state of developmental arrest until death (Figure 2D). Although a few larvaedid survive to adulthood after 2 days of HST, none of the larvaewere able to continue development after 4, or 6 days of HST (Figure 2D). Out of 450 larvaeexamined at all time points, only 10 expressing mFoxo1-AA survived, whencompared to 110 and 180 for larvae expressing dFOXO, and Gal4 alone,respectively. Presumably this occurs because Akt is unable to deactivatemFoxo1-AA, allowing it to continue functioning long after expression isinduced. Taken together, this data suggests that dFOXO is evolutionarilyconserved in function, possibly playing a role in the response tonutritional adversity, as seen in the formation of dauer larvaein C. elegans. Expression of dFOXO in the third instar larvae caused significantlethality, however, rare flies that did survive were much smallerthan control flies (Figure 3A),showing a phenotype similar to that caused by mutations in chico , dAkt  and dInr [6, 9].Expression of dFOXO under the control of the ubiquitouslow level Gal4 drivers, armadillo-Gal4, and hsGal4 (raisedat 25°C with no heat shock) had very little effect on growth (datanot shown). In contrast, increasing expression of dFOXO usingthe hsGal4 driver in flies raised at 29°C lead to the developmentof small adults, which were approximately half the weight of controlflies (Figures 3B and 3D). Analysis of thewings of these flies showed that the wing area was reduced by nearlyone third and that this reduction was due to a decrease in bothcell size and cell number (Figures 3C and 3D). SEM analysis ofthe eyes revealed reductions in both ommatidia number and ommatidiaarea, which reflect cell number and cell size, respectively (Figures 3E and 3F). These results implicatedFOXO in the control of body size through alterations in cell sizeand cell number. dFOXO reduces growth through alterations in cell sizeand cell number (A) Expression of UAS-dFOXO in the thirdlarval instar produces small flies (left) when compared to controls(right). w; hsGal4/CyO flies were crossed to w; UAS-dFOXO/UAS-dFOXO fliesand the progeny were heat shocked at 37°C for 4 hours during theearly third instar. 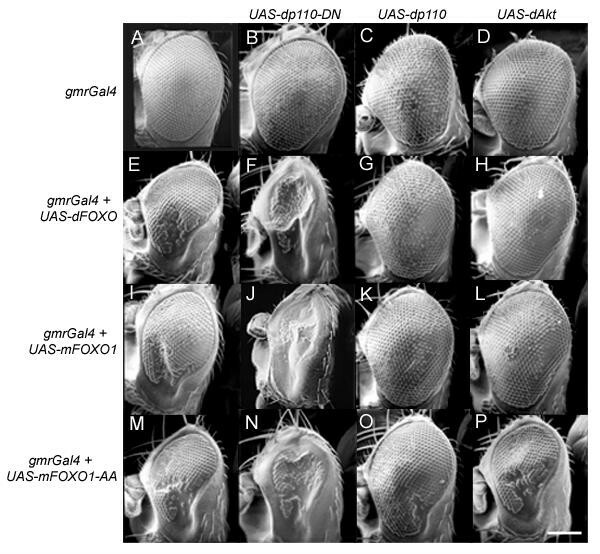 (B) Flies of the genotype w; hsGal4/+; UAS-dFOXO/+ (left)were smaller than w; hsGal4/+ (right) flies when raisedat 29°C. (C) The wings of w; hsGal4/+; UAS-dFOXO/+ fliesraised at 29°C were smaller than control wings (scale bar = 1 mm). (D) Flies expressing dFOXO (red bars) also showed a significant reductionin body weight, wing area, cell number, and cell size when comparedto control flies (grey bars) (p = 0.005). (E) Flies expressing dFOXOhad smaller eyes than control flies (scale bar = 150 μm), and (F)their eyes were reduced in both the number of ommatidia and thearea of the ommatidia (red bars) when compared to controls (greybars). Genotypes are; (A-left, B-left, C-top, D-red bars, E-left,F-red bars) w; hsGal4/+; UAS-dFOXO/+, (A-right, B-right,C-bottom, D-grey bars, E-right, F-grey bars). w; hs-Gal4/+. When dFOXO is expressed in the developing eye under the controlof the GMR-Gal4 driver,the eye is smaller, lacking many ommatidia and nearly all of themechanosensory bristles (Figure 4E).The remaining ommatidia are arranged in the typical hexahedral arrayand cross sectional analysis revealed that all of the normal photoreceptorcells are present (Figure 4E,data not shown). Thus, it appears that dFOXO expression causesa reduction in the number of cells but does not interfere with cellulardifferentiation and the organization of the ommatidia themselves.We have used this eye phenotype to test for interactions betweendFOXO and other components of the insulin signaling pathway. Expression of dPI3K-DN under the control of GMR-Gal4 leadsto the formation of relatively normal eyes with fewer and smallercells (Figure 4B). When dFOXO is co-expressedin the developing eye with dPI3K-DN the eye is nearly obliterated(Figure 4F).In contrast, co-expression of dAkt, and wild type dPI3K with dFOXOcauses nearly complete rescue of the phenotype, restoring the ommatidiaand nearly all of the mechanosensory bristles (Figures 4G and 4H). Thus, diminishinginsulin signaling (through overexpression of dPI3K-DN) allows forgreater activity of dFOXO, and enhancing insulin signaling (throughoverexpression of dAkt or dPI3K) leads to inhibition of dFOXO activity.Similar results were obtained using a Murine Foxo1 (mFoxo1)construct (Figure 4 I-L), indicatingthat the regulatory mechanisms between these two proteins is conservedand that they are functionally interchangeable. Regulation of dFOXO through insulin signaling is conservedbetween mammals and flies. The GMR-Gal4 driver wasused to drive the expression of (B) dPI3K-DN, (C) wild type dPI3K,(D) dAkt, (E) dFOXO, (I) mFoxo1, and (M) mFoxo1-AA, both alone andin various combinations (F-H, J-L, N-P) as indicated through therows and columns in the figure (scale bar = 150 μm). Genotypes are:(A) w; GMR-Gal4/+, (B) w; UAS-dPI3K-DN/GMR-Gal4,(C) w; UAS-dPI3K/GMR-Gal4, (D) w; UAS-dAkt/GMR-Gal4,(E) w; GMR-Gal4/+; UAS-dFOXO/+, (F) w; UAS-dPI3K-DN/GMR-Gal4;UAS-dFOXO/+, (G) w; UAS-dPI3K/GMR-Gal4; UAS-dFOXO/+,(H) w; UAS-dAkt/GMR-Gal4; UAS-dFOXO/+ (I) w; GMR-Gal4,UAS-mFoxo1/+, (J) w; GMR-Gal4, UAS-mFoxo1/UAS-dPI3K-DN,(K) w; GMR-Gal4, UAS-mFoxo1/UAS-dPI3K, (L) w; GMR-Gal4,UAS-mFoxo1/UAS-dAkt, (M) w, UAS-mFoxo1-AA/w; GMR-Gal4/+,(N) w, UAS-mFoxo1-AA/w; GMR-Gal4/UAS-dPI3K-DN, (O) w,UAS-mFoxo1-AA/w; GMR-Gal4/UAS-dPI3K, (P) w, UAS-mFoxo1-AA/w;GMR-Gal4/UAS-dAkt. The constitutively active mFoxo1-AA construct  was also expressed in the developingeye. Expression of this construct causes a phenotype similar tothat of dFOXO and mFoxo1, with characteristic lack of ommatidiaand mechanosensory bristles (Figure 4M).When mFoxo1-AA is co-expressed with dPI3K-DN the eye is nearly obliterated(Figure 4N),as seen with dFOXO and mFoxo1 (Figures 4F and 4J).Co-expression of mFoxo1-AA with dPI3K leads to a partial rescueof the phenotype, with still an obvious lack of ommatidia and mechanosensorybristles (Figure 4O).In contrast, co-expression of mFoxo1-AA with dAkt does not causerescue of the ommatidia or mechanosensory bristles (Figure 4P), indicating thatthis construct is not responsive to dAkt signaling. The partial rescueof the dFOXO phenotype by dPI3K appears to be mediated through alterationsin cell size (Figure 5) rather thancell number, as there is still an obvious lack of ommatidia andmechanosensory bristles (Figure 4O). Thisdata indicates that inactivation of dFOXO is required for the fulleffects of growth mediated by dPI3K and dAkt. dFOXO inactivation is essential for dAkt, but not dPI3K,mediated increases in cell size. Ommatidia area was measuredas a means to determine the effect of FOXO overexpression on cellsize. Expression of dFOXO (bar 2), mFoxo1 (bar 3), and mFoxo1-AA(bar 4) under the control of GMR-Gal4 causes a significantdecrease in ommatidia area when compared to the expression of Gal4alone (bar 1). 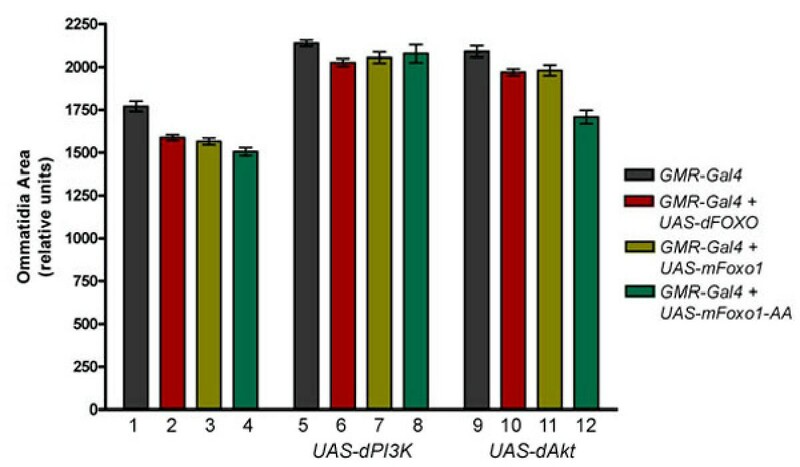 In addition, GMR-Gal4 was used to drivethe expression of dPI3K (bars 5–8), and UAS-dAkt (bars9–12), either alone (grey bars), or in the presence of UAS-dFOXO (redbars), UAS-mFoxo1 (light green bars), or UAS-mFoxo1-AA (darkgreen bars). Two sided t-tests were preformed to determine statisticalsignificance (p = 0.001). Genotypes are: (1) w; GMR-Gal4/+,(2) w; GMR-Gal4/+; UAS-dFOXO/+, (3) w; GMR-Gal4, UAS-mFoxo1/+,(4) w, UAS-mFoxo1-AA/w; GMR-Gal4/+, (5) w; UAS-dPI3K/GMR-Gal4,(6) w; UAS-dPI3K/ GMR-Gal4; UAS-dFOXO/+, (7) w; GMR-Gal4,UAS-mFoxo1/UAS-dPI3K, (8) w, UAS-mFoxo1-AA/w; GMR-Gal4/UAS-dPI3K,(9) w; UAS-dAkt/GMR-Gal4, (10) w; UAS-dAkt/GMR-Gal4;UAS-dFOXO/+ (11) w; GMR-Gal4, UAS-mFoxo1/UAS-dAkt (12) w,UAS-mFoxo1-AA/w; GMR-Gal4/UAS-dAkt. To examine the effect of dFOXO overexpression on cell size wemeasured the area of the ommatidia. Expression of dFOXO, mFoxo1,and mFoxo1-AA caused a significant reduction in the area of theommatidia (p = 0.001) (Figure 5).Expression of dPI3K caused a significant increase in ommatidiasize over wild type (p = 0.001) (Figure 5).This result is consistent with previous studies showing that dPI3Kaffects cell size in a cell autonomous manner. Co-expression of dFOXO, mFoxo1, andmFoxo1-AA with dPI3K had no significant effect on the enlargedommatidia (p = 0.001) (Figure 5).Thus, it appears that FOXO proteins have a very minimal effect oncell size in the presence of high levels of dPI3K. Surprisingly,this is the case even with the mFoxo1-AA construct, which is onlypartially responsive to PI3K signaling .This indicates that the dPI3K mediated increase in cell size canoccur through dAkt independent mechanisms. Expression of dAkt in the developing eye caused a significantincrease in ommatidia size, similar to that seen with dPI3K (p =0.001) (Figure 5). Co-expressionof dAkt with either dFOXO or mFoxo1, cause a slight, but insignificant decreasein the size of the enlarged ommatidia (Figure 5). However,co-expression of dAkt with mFoxo1-AA resulted in ommatidia thatwere approximately the same size as the ommatidia in eyes expressingGal4 alone (Figure 5), and significantlysmaller than the ommatidia in eyes expressing dAkt alone (p = 0.001)(Figure 5). This indicates thatthe deactivation of FOXO by dAkt is essential for dAkt to inducean increase in cell size. The lack of ommatidia and mechanosensory bristles caused by dFOXOexpression suggest a reduction in cell number during eye development(Figure 6A).Reduction of cell number can occur through either increased cell death,or decreased of cell proliferation. The Drosophila inhibitors ofapoptosis, Diap1 and Diap2 (data not shown), and the baculovirusinhibitor of apoptosis, p35 (Figure 6B),were unable to rescue the phenotype caused by dFOXO expression.In addition, acridine orange staining of eye imaginal discs expressingdFOXO showed no increase in apoptosis when compared to controls(data not shown). Drosophila Epidermal Growth Factor Receptor (dEGFR)signaling acts to protect differentiated cells from death duringeye development . We thought that thepro-survival effects of dEGFR may be sufficient to suppress thephenotype caused by dFOXO overexpression. Co-expression of dEGFRwith dFOXO, however, does not rescue the dFOXO phenotype as ommatidiaand bristles are clearly still missing (Figure 6D). Conversely, dFOXO doesnot appear to affect the phenotype of dEGFR overexpression as thegeneral disorganization of the ommatidia appears to be the same(Figure 6C).Thus, it appears that these two mechanisms are acting independently.Taken together, these results suggest that dFOXO overexpression doesnot cause cell death during eye development as direct inhibitorsof the apoptotic machinery (p35 and Diap1/2) and a known cell survivalfactor (dEGFR) were unable to rescue the dFOXO phenotype. dFOXO responds to dRas2 signaling, but not to inhibitorsof apoptosis. GMR-Gal4 was used to drive the expressionof UAS-dFOXO (A) alone, and in the presence of (B) UAS-p35,(D) UAS-dEGFR, (F) UAS-Ras2V14. UAS-Ras2V14 wasalso expressed in combination with UAS-mFoxo1 (G) and UAS-mFoxo1-AA (H).Scale bars equal 150 μm. Genotypes are: (A) w; GMR-Gal4/+; UAS-dFOXO/+,(B) w; GMR-Gal4/UAS-p35; UAS-dFOXO/+,(C) w; GMR-Gal4/UAS-dEGFR, (D) w; GMR-Gal4/UAS-dEGFR; UAS-dFOXO/+,(E) w; GMR-Gal4/UAS-RasV14, (F) w; GMR-Gal4/UAS-Ras2V14;UAS-dFOXO/+, (G) w; GMR-Gal4, UAS-mFoxo1/UAS-Ras2V14,and (H) w, UAS-mFoxo1-AA/w; GMR-Gal4/ UAS-Ras2V14. Since inhibition of apoptosis could not rescue the phenotypecaused by dFOXO overexpression in the eye, we examined if activatingthe cell cycle could inhibit the phenotype. Expression of the E2Fand Dp transcription factors has been shown to promote cell proliferationin the wing imaginal disc. Co-expressionof E2F and Dp with dFOXO was not sufficient to rescue the dFOXOphenotype (data not shown). Overexpression of constitutively activedRas1 (dRas1V12) has been shown to induce ectopic cellproliferation and G1/S progressionin the Drosophila wing disc[53, 54].Co-expression of dRas1V12 with dFOXO was lethal, so weused a constitutively active version of dRas2 (dRas2V14).Although dRas2 has not been characterized for its role in cellcycle control, it is possible that it has a similar function todRas1. Expression of UAS-dRas2V14 under the control ofGMR-Gal4 led to extreme overgrowth of the eye, lack of ommatidialorganization, and the formation of huge ommatidia (Figure 6E). Co-expression ofdRas2V14 with dFOXO was sufficient to restore many ofthe ommatidia and mechanosensory bristles lost through overexpressionof dFOXO alone (Figure 6A and 6F). A similar effectwas observed upon co-expression of dRas2V14 with mFoxo1 (Figure 6G). In contrast, theloss of ommatidia and bristles seen upon over expression of mFoxo1-AAwas not rescued by dRas2V14 (Figure 6H). This suggests thatdRas2V14 inhibits dFOXO via a dAkt phosphorylation dependent mechanism. For the most part, the genetic mechanisms that control size inmulticellular organisms are not well understood .Recently, components of the insulin signaling pathway have beenshown to regulate body size in Drosophila melanogaster throughalterations in cell size and cell number [1, 6]. We have identifieddFOXO as a negative controller of growth and organism size, whichis regulated by components of the Drosophila insulin signaling pathway,dPI3K and dAkt. Through overexpression studies in the developingeye, we have shown that dFOXO is regulated by dPI3K and dAkt ina manner that is consistent with the regulatory mechanisms deducedthrough studies in C. elegans and mammalian cell culture.In addition, overexpression of dFOXO in the larvae reduces larval growth,phenocopies the effects of nutritional stress, and causes alterationsin feeding behavior. With this in mind, we propose that dFOXO isinvolved in the response of Drosophila larvae to nutritional stress. The FOXO homologues appear to play an evolutionarily conservedrole in the control of cellular processes under conditions of lowlevels of insulin signaling [30, 31].Our experiments provide three lines of evidence supporting theconservation of this mechanism in Drosophila. First, dFOXO showsstrong sequence homology to Daf-16 and the human FOXO homologues(Figure 1B).One significant characteristic is the high conservation of the three consensusAkt phosphorylation sites, suggesting that dAkt is most likely ableto phosphorylate dFOXO in vivo, as shown biochemicallywith the mammalian FOXO homologues[33–35].Second, our experiments show that dFOXO and mFoxo1 cause nearlyidentical phenotypic responses when overexpressed in the developingDrosophila eye (Figure 4, 5 and 6).This suggests that the activity of these proteins is highly conservedas is observed when the C. elegans FOXO homologue, Daf-16,is expressed in mammalian cell culture.Third, the phenotypic effects of FOXO overexpression can be modulated byalterations in the insulin signaling pathway. Reduced insulin signalingleads to a drastic enhancement of the phenotype that results fromexpression of FOXO factors (Figure 4).In contrast, increased insulin signaling tends to mask these phenotypes,in a manner that is dependent on the integrity of the Akt phosphorylationsites (Figures 4 and 5). As a result, we believe that regulationof FOXO is conserved in Drosophila, and that this will be a veryuseful system in elucidating the function of FOXO transcriptionfactors in a model organism. Our results show that ectopic dFOXO expression can mediate reductionin cell size and cell number (Figures 3, 4, and 5).However, the mechanisms by which these reductions occur are stillunclear. Net reduction in cell number may occur through decreasedcell proliferation or increased apoptosis. Insulin and other growthfactors that activate PI3K and Akt have been implicated as potent survivalfactors in mammalian cell culture [10, 11].They prevent cell death, in part, by inhibition of FOXO factors andit has been shown that FOXO3a can upregulate expression of the pro-apoptoticprotein Bim. In Drosophila,reduction of insulin signaling can lead to apoptosis in the developingembryo [13, 14, 56, 57].It is possible that this increase in apoptosis is a result of dFOXO activation,however, when dFOXO is expressed in the developing eye there isno apparent increase in apoptosis, nor is the phenotype suppressedby inhibition of caspases, or by co-expression of a known cellsurvival factor, dEGFR (unpublished observations, Figure 6). These apparent discrepancies may bethe result of tissue specific differences. In mammalian cell culture,induction of cell death by FOXO factors seems to be limited to non-transformed haematopoieticcell lineages . In Drosophila,loss of dAkt function, inhibition of dPI3K, or overexpression of dPTEN,all induce cell death in the embryo[13, 14].However, in imaginal disc cells lacking PI3K function, there is noincrease in apoptosis. Thus, the cellsin the embryo and imaginal discs may react differently to reducedlevels of insulin signaling. Although we do not observe inductionof apoptosis upon dFOXO expression, it is possible that increasedlevels of dFOXO activity (eg. through dominant negative inhibitionof PI3K) do cause apoptosis. Studies in mammalian cell culture have implicated FOXO factorsin control of the cell cycle through increased expression of thecyclin dependent kinase inhibitor p27Kip1 [59, 60].It is possible that the reduction of cell number seen upon dFOXOexpression is a result of cell cycle inhibition. Co-expression ofan activated version of Drosophila Ras2 (dRas2V14) wassufficient to increase cell number in the presence of dFOXO (Figure 6). dRas1 has been shown to induce growthin Drosophila imaginal discs [52–54] throughactivation of dPI3K and the transcription factor dMyc . Although there is very little informationavailable about dRas2, it is possible that the function of dRas2overlaps with that of dRas1. Expression of dRas2V14 inthe developing eye does cause a phenotype that suggests overgrowthof cells (Figure 6E),and the dRas2V14 interaction with dFOXO appears to be dependenton dAkt signaling (Figure 6H).This is not surprising considering that dRas1  and mammalian Ras  have been shown to activate PI3K signaling.Interestingly, increasing the cell cycle through overexpressionof the transcription factors E2F and Dp did not rescue the cellnumber deficit seen upon overexpression of dFOXO (unpublished observations).This suggests the possibility that activation of dFOXO may overridethe function of other growth promoting factors, such as dMyc, which mediatesdRas1 induced G1/S progression .Supporting this, we have observed that increased growth as mediatedby dAkt is entirely dependent on its ability to inactivate dFOXO(Figures 4P and 5). Furthermore, increased growth mediatedby dPI3K appears to be dependent on dFOXO inactivation with respectto increased cell number, but not cell size (Figures 4O and 5). In humans, inactivation of FOXO factorsmay play an important role in tumor suppression by down regulating expressionof D-type cyclins, thus inhibiting cell cycle progression and transformation. It will be interesting to test theinteractions between dFOXO and other cell cycle promoters to determinethe extent of dFOXO dominance over cell proliferation. In addition to its effect on cell number, dFOXO is able to controlcell size (Figures 3 and 5). The ability of dAkt to increase cellsize is dependent on dFOXO inactivation, however, dPI3K does notneed to inactivate dFOXO to increase cell size (Figure 5). The difference between dPI3K anddAkt might be attributed to greater activity of the UAS-dPI3K transgene.However, expression of these constructs individually yields verysimilar results (Figures 4 and 5) indicating that this is probably notthe case. This suggests that dPI3K may control size through dAkt-independentmechanisms. One possibility is through the positive growth regulator,dS6k. dAkt appearsto increase growth through inhibition of a TSC1/TSC2 (tuberous sclerosis)complex[64, 65]. This complexacts through inhibition of dTOR (target of rampamycin) , which promotes growth through activationof dS6K [67, 68]. Although it appearsthat dAkt can upregulate growth through dS6K, dS6K activity is notreduced in larvae lacking dAkt or dPI3K .These results do not necessarily suggest that dPI3K and dAkt cannot activate dS6K, as dS6K levels may be maintained through aminoacid signals [66, 68]. dS6K activitywas shown to be dependent on phosphoinositide dependent kinase(dPDK1) , which interactsgenetically with dAkt, dPI3K, dPTEN, and dInr [56, 69] Thus,it is possible that dPI3K can modulate dS6K activity through dPDK1,independently of dAkt. Studies in C. elegans indicate that insulin signalingis a critical mediator of longevity and stress resistance[70, 71]. Oneof the most well-studied stress responses is the Daf-16 mediatedformation of the dauer larvae under conditions of starvation and/orcrowding. Several lines of evidence indicate that dFOXO may playa similar role in Drosophila larvae. When Drosophila larvae aredeprived of food prior to 70 hours AEL, they live in a state ofdevelopmental arrest for several days before death. However, whenstarved after 70 hours AEL, the larvae are able to develop intoadults that are reduced in size. This alteration in developmentalresponse has been termed the "70 hour change" and is likely determinedby the minimum size required for a Drosophila larvae to enter pupation. We have mimicked the "70 hour change"through overexpression of dFOXO at different stages of larval development,in the presence of ample food (Figures 2 and 3). For example, ubiquitous high levelexpression of dFOXO in the early larvae (i.e. before 70 hours AEL)leads to developmental arrest, whereas heat shock induced expression ofdFOXO during the third instar (i.e. after 70 hours AEL) leads tothe development of small adults. Second, the normal developmentof starved larvae can resume upon the acquisition of food. Similarly,developmental arrest caused by expression of dFOXO prior to the"70 hour change" can be reversed if dFOXO expression is discontinued(Figure 2). Developmental arrestcaused by expression of mFoxo1-AA before the "70 hour change" is notreversible suggesting a constitutive starvation type response asseen in C. elegans when Daf-16 phosphorylation sites aremutated. Interestingly,the reversibility of FOXO induced arrest has also been observedin mammalian cell culture. Third, underconditions of poor nutrition or crowding larval development doesnot cease, but the larval period is extended and small adults areproduced . We have replicatedthis effect through low level expression of dFOXO during the courseof development (Figure 3). Finally,feeding behavior is drastically altered in larvae expressing dFOXO(Figure 2), causing them to wanderaway from their food. These larvae are often found crawling on thesides and lids of Petri dishes. This response may provide a selectiveadvantage in the search for food as seen in C. elegans dauerlarvae, which often crawl up to the highest point possible in hopesof attaching to passing organisms that could move the larvae tonew locations with better food supply .Taken together, these results suggest that dFOXO activity may act topromote survival during times of nutritional stress in a mannerthat recapitulates the formation of dauer larvae in C. elegans.It is tempting to speculate that dFOXO plays a role in responseto other forms of stress, as observed with Daf-16[70, 71].Mammalian FOXO factors have been implicated in the protective responseto oxidative stress [73–75] andFOXO factors are upregulated in response to caloric restrictionin rat skeletal muscle . Thus, it is possiblethat FOXO factors provide an evolutionarily conserved switch, bywhich an organism can alter its developmental program in orderto promote survival under harsh conditions. Previously, it was observed that activation of insulin signalingcaused larvae to wander away from their food . We have observed a similar effectthrough overexpression of dFOXO, which acts in opposition to insulinsignaling. As described previously, it is possible that hyperactivation ofinsulin signaling may lead to depletion of the haemolymph by increasingthe cellular uptake of nutrients . Thiswould lead to increased hunger and cause the larvae to wander insearch of food. Since PI3K activity is lost under conditions ofstarvation  it stands to reasonthat dFOXO would be active under these conditions. Being a transcriptionfactor, endogenous dFOXO could activate a host of genes under conditionsof starvation leading to a "genetic starvation profile". Indeedgene expression is drastically altered upon starvation. Thus, dFOXO may induce larval wanderingthrough expression of a sub-set of genes which are normally activeduring starvation, whereas activation of insulin signaling may inducelarval wandering by causing physiological changes that lead to a falsesense of starvation. We have shown that dFOXO is conserved in sequence and regulatorymechanisms when compared to homologues from mammals and C. elegans. Drosophilamelanogaster provides a powerful tool for the analysis of genesin a whole organism. Thus, future studies in this organism shouldprovide new insights into the biological function of the FOXO transcriptionfactors. This may have implications to the study of cancer and diseasesrelated to insulin, such as diabetes and obesity. Our data, takentogether with that of others, suggests that dFOXO plays a protective rolein the developmental response of Drosophila larvae to nutritionalstress. Thus, it is possible that dFOXO plays a functional rolein response to multiple forms of stress. In a world plagued withmassive pollution and hunger it is important that we understandhow our bodies react to starvation and environmental stress. The human FOXO4 gene was used to search the NCBI (NationalCenter for Biotechnology Information) genomic data bank for Drosophilahomologues. Drosophila genomic sequences with high homology to FOXO4 wereidentified and used to search the Berkeley Drosophila Genome Project(BDGP) for homologous cDNAs. This procedure allowed us to identifythe clone, LD05569, which was sub-cloned and sent for sequencing toCortec DNA Laboratories, Inc., Kingston, Ontario. Restriction mappingand sequencing revealed a cDNA of approximately 3.6 kb translatinginto a theoretical protein sequence of 463 amino acids (Fig 1B). Note that thereare two other potential start codons that may act as sites for translationinitiation, and are located slightly upstream of the start sitewe have identified. mFoxo1, and mFoxo1-T24A/S253A (AA) clones weregenerously provided by Dr. William H. Biggs III  and the dFOXO cDNA, LD05569,was obtained from Research Genetics. The cDNAs were ligated intothe p[PUAST] expression vector for use of the UAS/Gal4 ectopic expressionsystem . Transgenic flieswere created by injecting p[PUAST]-FOXO constructs into w1118 Drosophila embryos.Driver lines, GMR-Gal4 , heatshock-Gal4 (hsGal4), and Act5C-Gal4(ActGal4) were obtainedfrom the Bloomington stock center, as were the UAS lines UAS-dEGFR, UAS-dRas2V14, UAS-E2F,UAS-Dp, UAS-p35, UAS-Diap1, and UAS-Diap2. UAS-dPI3K and UAS-dPI3K-DN (UAS-dp110D954A)were generously provided by Dr. Sally Leevers. Heat shock treatmentwas conducted in a 37°C water bath. All experiments were performed at 25°C unless otherwise stated.For scanning electron micrographs, flies were desiccated overnightand coated in gold. Ommatidia area was measured using NIHimage 6.2and each value shown is the mean of 9 measurements, taken from 3individual eyes. Due to the low survival rate of males expressing dFOXO,only females were included in the analysis of wings and body weight.Flies were raised under non-crowded conditions and a minimum of12 flies were weighed individually to determine average body weight. Wingarea was measured using ImageJ 1.28u, from the National Instituteof Health. Cell size and cell number were calculated as previouslydescribed. A minimum of10 wings were analyzed per genotype. Two-sided t-tests were performedto determine significant differences. The Gal4 driver line w; ActGal4/CyO was crossed to w1118, w;UAS-dFOXO/UAS-dFOXO, w, UAS-mFoxo1-AA/w, UAS-mFoxo1-AA,and yw; UAS-dPI3K-DN/UAS-dPI3K-DN. Since the ActGal4 insertionis not homozygous, we assumed that only half of the hatched larvaecontained the insertion. This assumption was supported by observationof the adults arising from each cross. For w; ActGal4/CyO X w1118 thenumber of adults produced was nearly equal to the number of hatchedembryos, with approximately half bearing the CyO balancer chromosome.For w; ActGal4/CyO X w; UAS-dFOXO/UAS-dFOXO and w;ActGal4/CyO X UAS-mFoxo1-AA/w, UAS-mFoxo1-AA onlyflies bearing the CyO chromosome survived and the numberof adults was approximately half the number of the total hatchedlarvae. Small wandering larvae were observed only for w; ActGal4/CyO X w;UAS-dFOXO/UAS-dFOXO and w; ActGal4/CyO X UAS-mFoxo1-AA/w,UAS-mFoxo1-AA, and in these crosses, only the larvae presentin the food were growing. Thus, we assumed that small wanderinglarvae were of the genotypes w; ActGal4/+; UAS-dFOXO/+,and w, UAS-mFoxo1-AA/w; ActGal4/+. For the feeding behavior assay, embryos were collected on applejuice agar over ~2 hour time periods, counted, and transferred toa Petri dish with filter paper that was soaked in 20% sucrose inPBS. In the center of the Petri dish was a small piece of standardDrosophila food. At 48 hours AEL the number of hatched eggs wascounted to account for unfertilized embryos. At both 48 hours and72 hours AEL the number of larvae not on the food were counted. Thepercent wandering larvae was calculated based on the number of larvaeoff the food, the number of hatched eggs, and the assumption thatonly half of the total larvae contained the ActGal4 transgene.The results presented are the average from three separate trialsand statistical significance was determined using a two-sided t-test.Individual values were taken from analysis of approximately 50 larvae. We thank Roy Ficken and Lisa Lee from the Department of Biologyat the Memorial University of Newfoundland for their technical assistance. Thanksto Dr. Ellen Larsen for advice and support during the early stages ofthis project. Thanks to Drs. William Biggs III and Fredrick G. Barrfor the mFoxo1 clones and the Berkeley Drosophila Genome Projectand Research Genetics for the dFOXO clone. Thanks also to Drs. SallyLeevers and Michael Waterfield, and to the Bloomington Drosophilastock center at Indiana University for providing fly stocks. Thanksto Dr. Ernst Hafen, Dr. Helene Volkoff, Martin Junger, and AnnikaHaywood for discussion and/or comments on the manuscript. Thisresearch was funded by the Natural Sciences and Engineering ResearchCouncil of Canada, the Banting Research Foundation, the Dean ofScience of Memorial University of Newfoundland (start-up funds)to BES. JMK was partially funded by the School of Graduate Studiesat the Memorial University of Newfoundland. JMK conducted all genetic experiments and drafted the manuscript,as well as playing a partial role in sequence analysis of dFOXO andthe creation of transgenic fly lines. JTD was responsible for thecloning and sequence analysis of dFOXO. JML participatedin the creation of transgenic fly lines. BES initiated investigationof the dFOXO gene, and created and initiated characterizationof UAS-dFOXO transgenics, as well as acting as supervisorand primary investigator.